For sure, there are a lot of nice little visualisation tools for flickr and even more has been written about tagging, folksonomies, and web 2.0 search (including the 'flickr!' article in this blog...). 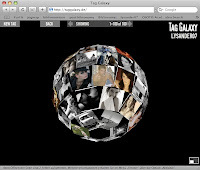 Nevertheless, I found a new flash-based application for flickr tag / search visualisation that is worth while taking a look: The Tag Galaxy.